Our guild was just blessed with donated material by the husband one of our long time members that passed away recently and we are needing some quick, simple, but nice patterns to make lap size quilts from. Can you please share with me what some of YOUR favorite, quick & easy patterns are? Can't wait to see what everyone says. I am sorry about the loss of your friend. I like the "take five quilt". You need 5 coordinating fabrics and off you go for a quick nice quilt. Thanks for the excellent link Woody. This site is fabulous. What an amazing resource. There is a free pattern on Fabric Buffet's web site called Kathy's Disappearing Nine Patch. 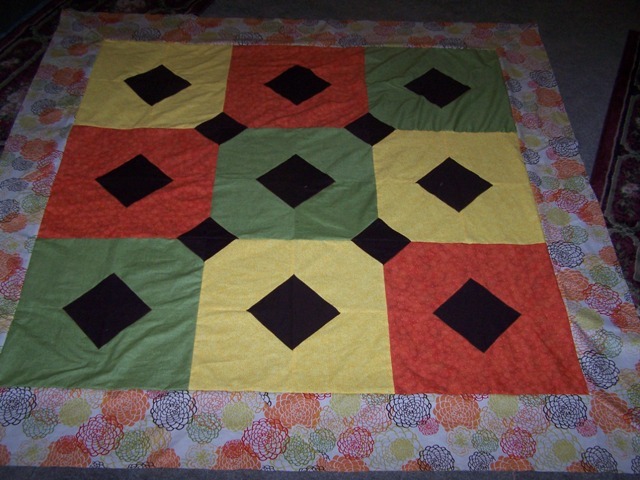 The big difference in this pattern is, it is strip pieced and then cut, it is not squares. Goes together really quick. Just Can't Cut It is another easy and quick pattern. I like Yellow Brick Road. It also lends itself to larger size scraps. Fast easy... and you can't really goof it up! Just Can't Cut It is definitely my go to pattern! 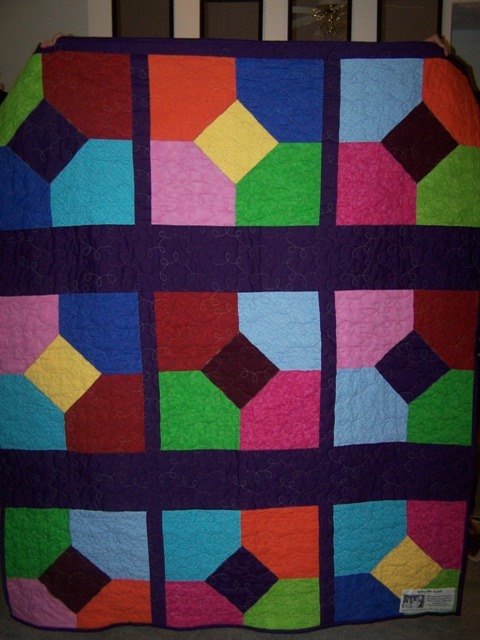 I've made several and the quilt owners love how the look. Log cabin or rail fence are old standbys that work up fast. Hi, teddysmom, please clue me in the the Just Can't Cut It pattern. It sounds interesting, but I've never heard of it before. Thanks loads. Lucky Stars by Atkinson Designs...the cutting takes awhile, but once that is done, the sewing is quick....I have loved every quilt I have made with this pattern! Illusions is fairly fast and very pretty. Uses two colors look for it at quickquilts.com. I love Warm Wishes... I think it is a Project Linus pattern. Works up well with just a few colors and goes very, very fast! The 10-minute block is usually my go-to pattern. You can make it out of any size squares and they go together really fast. 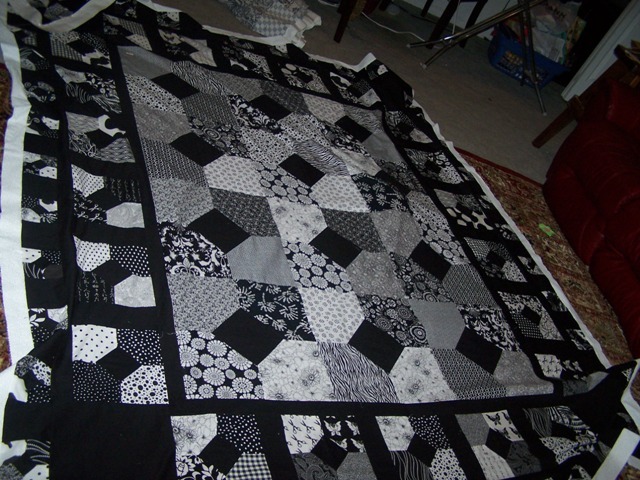 In the black and white quilt, I used three different sizes of the 10-minute block. so many variations, and so easy to make it truly stunning. Turning twenty is one of my favorites. I like warm wishes for quick piecing. Thanks for sharing this site, JulieR. I love Jenny's tutorials and will definitely being trying this pattern. Go to the Missouri Star Quilt Company site and view their videos. They have a number of quick and easy patterns that would work well for you. "Take Five" is easy and with only five fabrics, it's done, oh, so quickly! Potato Chip Quilt Pattern. Betcha can't make just one! So sorry for your loss. It's so very hard to lose a friend, but the quilts you make will be like having part of her live on. My favorite pattern is the simple square of a feature focus fabric alternating with a 9-patch, and you can even make that square be a snowball block. I also like the 8-pointed star block, with Eleanor Burns quick and easy flying geese technique it works up quickly and you can easily change the square center with 4-patch, 9-patch, pin wheel, etc. for variation. Hope this helps.